A domain reselling business can be a bit tricky, trying to balance customer satisfaction and profits. You can be a powerful domain provider if you have the right program backing your business. 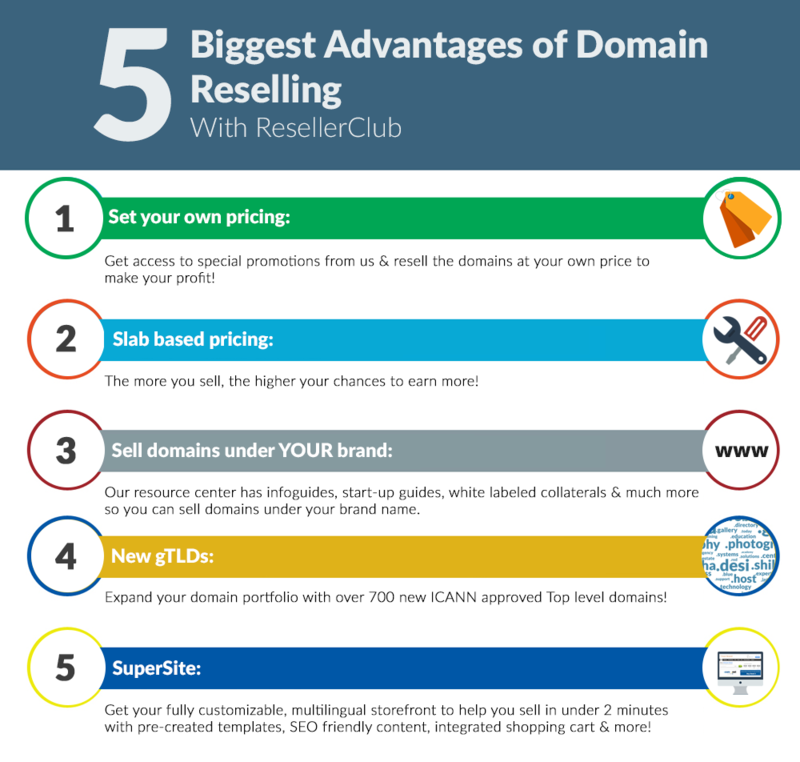 ResellerClub’s domain reseller program is a completely white-labelled offering designed to help your business grow. We cater to over 200,000+ web professionals. At ResellerClub, we always ensure that your customers remain your customers alone. Our Domain Reseller Program has some great features specifically designed to help you earn maximum profits! It allows you to sell your web related products like Domains, Hosting, Servers, Cloud, Security, etc. Also, it allows you to manage your customers, as well as, sub-resellers easily. It provides the resellers with a ‘fully brandable storefront’ that is free. As a reseller, another advantage you regularly get amazing promos and offers on various domains and hosting products. The payments portal is simplified as it is pre-integrated with your control panel with various payment collection gateways like Credit Cards, Debit Cards, PayPal, Wire Transfers and several others to make collecting payments from your customers effortless! We are committed to providing 24×7 Sys-Ad Level dedicated support to guide you in times of a roadblock. If you’re new to your business we even provide top-notch marketing collaterals like InfoGuides, Startup Guides, White-labelled Collaterals, etc. Here’s a cool infographic with a list of the top 5 advantages of reselling with ResellerClub. So don’t wait any longer and kickstart your business with us. Click here, to join the platform trusted by more than 200,000 web professionals. Got something to say? Please do leave it in the comments section below!